Cardiff City have announced operating changes as millionaire owner Vincent Tan seeks greater "control" over the day-to-day running of the club. The most significant move will see chief executive Alan Whiteley stepping down in the coming weeks, to be replaced by Simon Lim. Whiteley, who has been in the role for 12 months, is considering an offer to remain on the board of directors. Malaysian Lim had recently replaced Doug Lee as financial director. That role will now be taken by Richard Thompson, in an initial acting capacity. 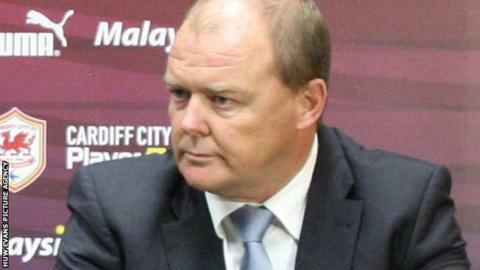 Whiteley, who spearheaded the club's efforts to persuade Cardiff fans to accept the summer rebrand, including the controversial change from blue shirts to red, admitted being removed from his post came "a litte bit out of the blue". He added: "[It's] slightly disappointing, but predictable, I suppose in some ways. "I think in fairness to Vincent Tan, he's honoured his... commitments that he made during the whole of the rebranding [in the] the close-season. "He's put the money into the team. He's increased his investment so I think he feels that he's at the point where he wants a greater degree of control and a greater involvement and probably, in that sense, having his own man at the helm is probably a sensible step for him. "At the moment I'm just thinking through what that means and whether I can play a meaningful role. "If I can help the club in any way I will continue to do so." Tan, who has promised to invest £100m in the Championship club, said: "I would like to place on record my thanks and respect to Alan for the way in which he has held the office with dignity over the last year. "His professionalism and hard work has helped to improve club operations behind the scenes, and from here, with the hard work of a number of key people we will look to build on his legacy in the months and years ahead. "All connected to Cardiff City Football Club owe Alan a debt of gratitude as he leaves his post with our sincere best wishes."